I couldn’t figure out what book I wanted to read recently (the great thing about the Read the World Project is I’ve got a lot of interesting options but it does sometimes feel like homework) so I went back to my comic shelves and read a few of my unread volumes. I have stuff to say about them but not a lot so here’s some mini reviews. I really loved this comic! 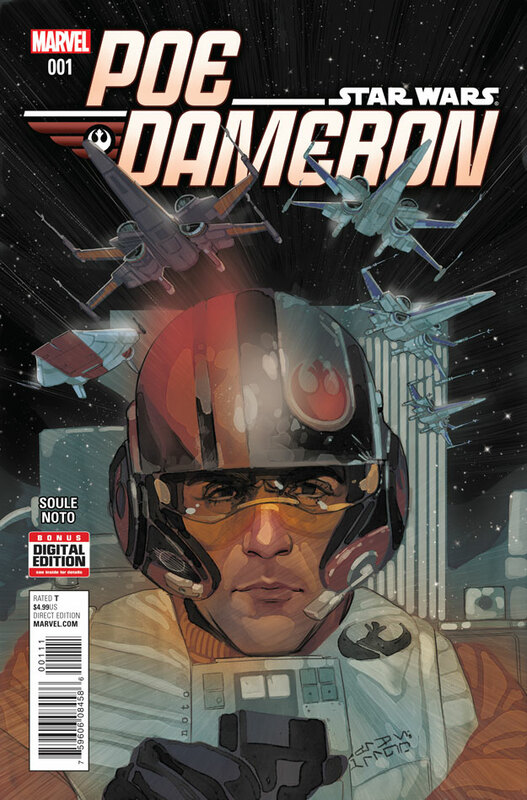 Poe Dameron stole my heart in The Force Awakens so when I heard he was going to have his own comic series I knew I had to read it. Black Squadron is a prequel to The Force Awakens and Poe, along with his friends in his squadron, are tasked by Leia Organa to find Lor San Tekka (the old guy Poe’s talking to at the start of The Force Awakens – boy I’ve said The Force Awakens a lot in this paragraph!). So, the comic is all about the mission but also the downtime and you get to see Poe interact with his team which is great. It’s a funny comic, Poe’s charm shines right off the pages and it’s a nice way to learn more about the character. Plus, his relationship with BB-8 is brilliant, there’s a scene where the whole plan depends on BB-8 and some other droids and Poe has complete faith in them. I also love the art style in Black Squadron. Phil Noto draws some gorgeous stuff (his Black Widow run is also fab) and I love the colours. It is a bit funny seeing Oscar Isaac’s face in a comic, but I soon got used to it. This is such a fun comic with good adversaries for Poe and his team and they kind of go on a heist at one which was wonderful (heists are my favourite thing ever) and I can’t wait till Volume 2 is released. 5/5.